I've got a 2000 CR250R that I've posted several times about. I was finally able to take it to the track a few weeks ago and get a better feel for it. When I pulled the plug this week, I found it to be pretty black (coffee-like). I know this indicates a rich condition, which most of my posts have been about. My first question is: I've gone leaner on the main jet (172), up one clip on the needle (2nd), should I consider going leaner on the idle jet? It's currently at a stock 48. I don't think I ever made it past 1/2 throttle at the track, which is why I'm suspecting the idle jet may be a bit rich. It also starts on the 1st or second kick every time. I also discovered a crack in the center of a dent on the pipe. I put a little high temp silicone and it held up, but I'll probably be looking for a pipe soon. Any recommendations? How will a new pipe affect the jetting? Can I expect to go leaner or richer after the switch? What furlix are you using? Furlix? I'm not sure what that is... I googled it and didn't get anything I could make sense of either. I was asking what fuel mix you are using? No prob. I thought it might be some unfamiliar lingo XD. I'm running Lucas Oil semi-synthetic mix at 32:1. You have a Kiehin Air Striker in the bike right? If you don't get on it, you will always have a darker plug. If you are riding at half throttle and pull the plug and it's light tan, then when you get on it, like in the a wash or some dry lake bed then you are going to be too lean. Please do yourself a favor and do a real Plug chop to see where your top end jetting is. I appreciate the input, but there are not lake beds... or hills... or anything where I could "open it up" down here in South Texas. I'm a novice rider trying to make the bike run well at the local track where I have a total of 15 laps experience ( 3 sets of 5 laps before my legs, back, and shoulders gave out). I thought the point of having two jets was for the bike to run well at low rpm (idle jet) and at high rpm (main jet). That is why I am wondering about the idle jet. If I never made it onto the main jet, that should not be affecting my plug, should it? The Pilot Circuit, Tuning from Idle to ¼ Throttle -You can use the air screw to help determine if your pilot jet is appropriately sized. Take your bike for a short ride letting the engine come up to normal operating temperature. With the engine stopped, transmission in neutral and the bike on its stand turn the air screw clockwise until it just seats, gentle now it’s delicate and you don’t need to torque it down just gently seat it. Now turn the air screw a quarter of a turn out so the engine will fire and start it. 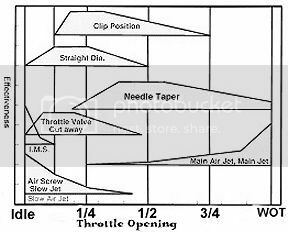 Slowly turn the air screw counter clockwise ( out ) until the point where the engine just reaches the maximum obtainable rpm and continuing to turn the air screw beyond this point wont increase the engine speed (rpms) any further. I find it’s easier to hear the rpm increasing if you set the idle at its lowest possible position without the engine stalling. You’ll want to repeat this procedure a couple times until you’re confident that you’ve found the right spot and that the result is reproducible. When you’re comfortable count the number of turns ( 360° revolutions ) you’ve backed the air screw out to reach this point. The normal operating range is between 1 and 1.5 turns out so if you find the ideal setting is less that 0.75 turns out consider installing the next richer pilot jet (larger number ). If you find the ideal setting is more than 2 turns out consider installing the next leaner pilot jet ( smaller number ). Last edited by VAL; 09-24-2013 at 01:06 PM. Back to this thread now... after my rebuild I'm noticing a bit of a miss (bog?) around 1/2 throttle. Does checking float height and then playing with the clip position sound right? Yes, in a nutshell. Did you do a reread on Spanky's suggestions? Plug readings other than wide open chops don't tell me as much as "feel" does. Yeah, I re-read it and looked at the pic VAL posted. I was just wondering if there would be any other concerns due to the recent rebuild. I opened up the carbs, verified the float height (using parallel to carb body method due to lack of appropriate tool), and put the clip right in the middle of the needle. It did clean it up a bit. Now I'm messing with the fuel and idle screws to try to get it a bit better. When was the last time that the lower end was rebuilt? Leaky crank seals can cause lots of grief. Bless you, my child! A bottom-end believer! Float height being low would effect it right when you crack the throttle. At 1/2 I'd be looking at the clip or changing to a different needle. I assume your silencer has fresh packing...... Jetting with a blown out silencer is a waste of time. The packing is not new, but I only rode twice after replacing it. Changing the clip helped. Now it just feels like it signs off a little early, but it has been a bit cooler than it normally is around here (50-80 vs the usual 90-110). If you have any doubts about the float level it is an easy thing to check. a 5 dollar set of calipers or even a 2 dollar ruler will work. a 16mm end wrench works in a pinch. I tilt the carburetor to where there is no contact between the float needle and the float yoke or crossbar tab. then rock it to where they just touch. measure there. the float does affect the jetting throughout the entire range. after that keep trying different things, and make notes. your needs may change as you ride longer and harder. some try to jet one that really isnt warmed up the way you are going to be riding it for longer practice sessions. for the heck of it, what position was the jet needle in when you say you put in in the middle?